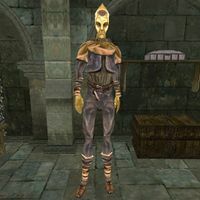 Tusamircil is an Altmer alchemist who sells ingredients at the Mage's Guild in Wolverine Hall. He is a restocking vendor of the following ingredients: Ampoule Pod, Bungler's Bane, Corkbulb Root, Crab Meat, Hound Meat, Kwama Cuttle, Racer Plumes, Small Kwama Egg, Spore Pod and Trama Root. Tuscamircil is involved in two quests: one for the Aundae Clan and another for the Thieves Guild. "Yes, I made an agreement with the Guild to bring me a potion recipe. Why are you standing here talking to me instead of looking for this recipe?" "So do you have a recipe for a potion of dispel magic?" Yes, here it is [Dispel Potion Formula has been removed from your inventory.] "Yes, this recipe will do nicely. Now leave me to my studies." "You already brought me the recipe. I have it here somewhere..."